Groupon as a concept has been steadily declining since it first emerged a few years ago. There can be no doubt that this has in part been due to the realisation that you simply don’t get the same level of service or value for money. Never has this been so true as in the case of laser tattoo removal in Bournemouth and Winchester. With the explosion of tattoo studios has come the marked increase in laser tattoo removal requirements. A large percentage of this increase has been due to a mixture of simply ‘bad art’ and even spelling mistakes. Laser clinics are currently in a period of deregulation whilst we await for the government to decide who will be the next regulatory body. Many tattoo studios in Bournemouth and Winchester have seized this opportunity to buy in cheap lasers (often from China) and are performing laser tattoo removal treatments in Bournemouth, a field of expertise they know little about and often with no training. Cheap lasers bought in from China (which at best achieve some fading, if any) often arrive in the UK with nothing but a badly translated user manual. I heard of one tattoo studio near Charminster which was settting up a laser machine in the same room as other artists who were tattooing at the same time, with no provision for eye safety. As a laser trainer and laser safety supervisor I am nothing short of appalled at this lack of duty of care. 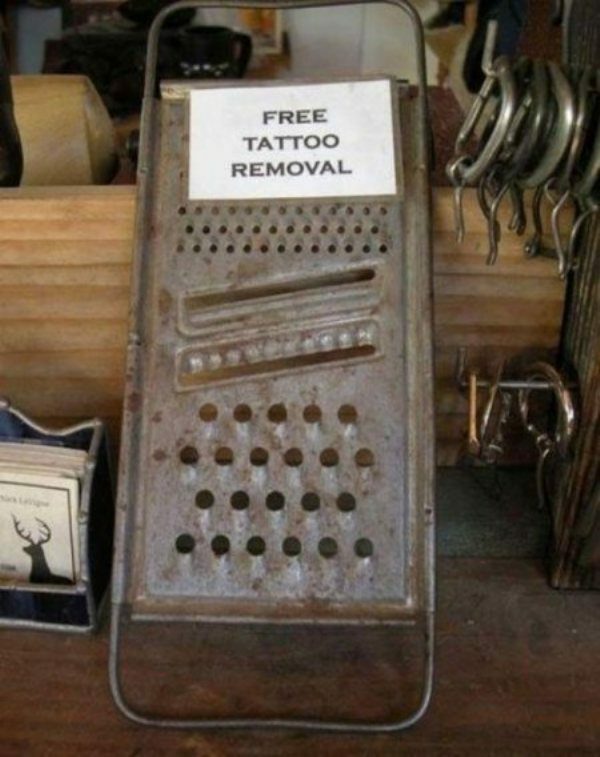 So why are some laser tattoo removal machines cheap and some expensive? Well, it’s certainly not down to just cheap labour in China. It comes down to the power of the laser tattoo removal equipment itself. One of my clients told me with great confidence, that their tattoo artist had been ‘very happy to confirm indeed’ that he operated a ‘Q-Switched laser’ thereby offering what dermatologists recommend. That in itself, shows the sheer and utter ignorance as a result of lack of training that is currently out there. Anyone worth their salt knows that you simply cannot perform any kind of laser tattoo removal in Winchester or Bournemouth if the laser beam has not been Q-switched. This does not mean that it is a medical grade laser. The Q-switching of a laser beam is simply required for it to deliver its power in a much shorter period of time. This alters it from just heating the area, to focusing the energy on shattering the tattoo ink so that the body can effectively remove it via the blood. But there is a huge difference between an ‘Active’ Q-switched YAG laser for laser tattoo removal and a ‘Passive’ Q-Switched laser for tattoo removal. I often tell potential clients who are tempted to have their laser tattoo removal in Winchester and Bournemouth within a tattoo studio setting, to simply ask their tattoo artist whether their Q-Switched laser is ‘active’ or ‘passive’. If they look at you a bit blankly, then you have your answer. Passive Q-switched lasers are only just powerful enough to achieve some tattoo fading. You need the additional power of an Active Q-Switched laser to effectively remove the unwanted ink and actually get rid of the tattoo. The other main difference between active and passive Q-switched lasers is, you guessed it, the price. Put simply, most tattoo studios are either not willing or not able to spend the £60 – £80K required to purchase a medical grade active Q-switched laser for effective laser tattoo removal. And don’t get me started on the lack of laser training in place……perhaps for my next blog. 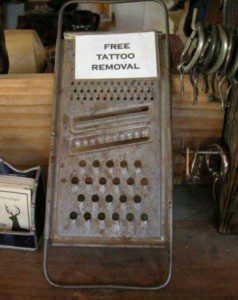 Like all things in life, you really do get what you pay for, and never has this been so true as with laser tattoo removal in Winchester and Bournemouth. As a laser clinic owner, laser trainer and laser safety supervisor, if I was able to get the same results with cheaper equipment, I wouldn’t have invested tens of thousands of pounds in more expensive lasers. I did so, because it was the right things to do and at Laser Skin Solutions we are here for the long term, not to make a quick buck. Laser Skin Solutions is really excited to announce the opening of its new laser clinic in Winchester. Based in Southgate Street, our new Winchester laser clinic is perfectly situated for easy access from the town centre and car parks. Clients will no longer have to travel to Southampton for laser treatments as we are now offering laser hair removal in Winchester and laser tattoo removal in Winchester. If you are looking for laser treatment in Winchester, Laser Skin Solutions will be offering everything you’d expect from a dedicated Winchester laser clinic, from laser hair removal to fractional laser skin resurfacing. We operate medical grade lasers, IPLs and Q-switched lasers for all your Winchester laser skin treatments and needs. At Laser Skin Solutions Winchester we offer a choice of both laser and IPL for laser hair removal, meaning we can treat all skin types. We also offer laser thread vein removal both for the face and legs. Our new fraxellated laser means we can now perform better laser skin rejuvenation than ever, allowing us to offer effective fractional laser skin resurfacing in Winchester which offers great results with minimum downtime compared to CO2 lasers. If you require laser tattoo removal in Winchester, Laser Skin Solutions is now offering state of the art laser tattoo removal meaning you no longer have to travel to Southampton in order to remove your tattoo. Our Active Q-Switched YAG is the gold standard treatment as recommended by dermatologists for laser tattoo removal. We are the only laser clinic in Winchester offering laser tattoo removal. There are still tattoo colours however that we are unable to remove with lasers. Our advice therefore is to speak to us before getting inked if you like the idea of removing your tattoos every few years in order to get new ones done. For laser hair removal the average amount of laser treatments required is 6-8 sessions spaced at 4 – 6 weeks for the face and 6 – 8 weeks for the body. Laser hair removal in Winchester has never been more convenient. Our Winchester laser clinic is located in the centre of Winchester, in Southgate Street. Would you like to be hair-free by summer 2016? If so, start planning your course of laser hair removal today. People who start their laser hair removal this September, will be enjoying the hair-free benefits on the beach next summer. People on average require 6-8 laser treatments on any given area in order to achieve permanent hair removal. With the 6-8 week gap required between treatments, you’re looking at a total of around 36-48 weeks to complete your laser hair removal course. Think of it as similar to a school year. If you start in September, you should be looking to be hair-free by the following June, perfect for the start of the summer. Winter is the ideal time for laser treatment due to the way in which laser hair removal works. Lasers and Intense Pulsed Light Systems (IPLs) target melanin in the hair. Light is absorbed by the pigment in the hair and is heated to around 60-70 degrees for a split second. This is why it’s crucial that the surrounding skin is not tanned, otherwise the laser will end up heating your skin as well. So if you’re not careful or choose the wrong provider, using the wrong piece of equipment for your skin type, lasers and IPLs can easily damage your skin and your skin pigmentation. Most pictures I see on the internet of laser burns (like the ones below) are either because the client clearly has an active tan, or the wrong laser or IPL has been used. Photos of people with dark skin, sporting large burn marks in the shape of rectangular blocks have clearly been treated with an IPL when this should never have occurred. A good laser clinic will always have a choice of both lasers and IPLs in order to be able to select the correct equipment for the appropriate skin type. Clinics which only invest in one type of laser technology have in the past tried to push the boundaries of their laser or IPL in a bid to try and treat as many people as possible, but have done so to their detriment. Skin-typing clients correctly according to the Fitzpatrick scale is also crucial in order to avoid side effects like laser burns, blistering and scarring as seen in the above photos. The Fitzpatrick skin type scale ranging from 1 (being the palest) to 6 (black skin) is crucial in determining the laser settings required in order to do an effective treatment, whilst protecting the skin. A thorough laser consultation therefore should set aside ample time in order to determine a client’s skin-type by asking various questions including reaction to sunlight, tanning ability and assessing their hair and eye colour. Get the skin type wrong, even by just one, on the Fitzpatrick scale and the client will be either be suffering the consequences, or paying for an ineffective treatment. Laser hair removal is an extremely safe and effective treatment if you choose your clinic wisely. At Laser Skin Solutions we are the most highly qualified laser clinic in Bournemouth. We are the only clinic which insists on staff obtaining the BTEC Laser & Light Award (currently the highest national qualification available). As a laser trainer, I also train dermatologists, GPs and clinicians in the use of lasers and IPLs and have completed the Advanced Skin Laser Application Award from the University of Manchester. We allow an hour for consultations in order to thoroughly assess the suitability of a client for laser treatment, which includes ample time to correctly skin-type a patient. We offer a choice of both laser and IPL meaning you will be treated with whichever is most appropriate for you, not because it is the only laser we happen to have. To read more about us and why we are the most highly qualified laser clinic in the area to deliver your treatment, click on the about our clinic page. With the recent explosion of tattoo studios in Bournemouth there has undoubtedly been an increase in the requests for tattoo removal. Whilst laser tattoo removal is without a doubt the single most effective treatment for the removal and fading of tattoos, some people are turning to risky and often dangerous alternatives in a bid to get rid of their unwanted tattoo. The internet is awash with all kinds of suggestions for removing tattoos at home. You only have to log on to YouTube to see some of the desperate measure people will go to in order to de-ink their skin. Here we give you a clear account of what is involved and what outcomes you can expect from the various DIY tattoo removal methods. This method of tattoo removal is as old as tattooing itself. It involves rubbing salt and water into the tattoo for a period of about 30-40 minutes, usually with the aid of an abrasive object like a block wrapped in gauze. The aim is for the salty mixture to peel and rub away the upper layers of the skin. Cheap table salt is all that is required for salabrasion (although some people use rock or sea salt) which is why initially it appears so appealing to people desperate to remove their unwanted tattoos. After treating the tattoo for 30-40 minutes with the salabrasion mixture, an antiobiotic cream is applied and the area is then covered with sterile gauze for a few days. Days later the process is repeated again. There are various instructions and even videos on YouTube, which show both the method and disastrous results of salabrasion. These have been met with a range of comments from online viewers, anything from ‘Wow, mate can’t wait to see you treat your next tattoo’, to ‘You’re an idiot’. We’re inclined to agree with the latter. 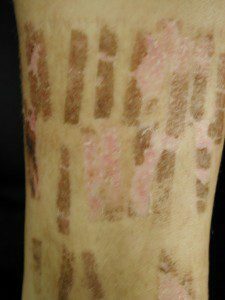 The upper layers of the salabrasion treated skin die and start to separate from the healthy skin below, in theory taking the pigment (tattoo) with it. Extremely painful, high risk of infection, hyper or hypo-pigmentation of the skin (discolouration), permanent scarring, weeping. Whilst historically dermatologists sometimes used this method (under strict hygiene procedures and anaesthetic), this is an extremely risky approach to home tattoo removal given the high risk of infection and scarring. It is also not very reliable in terms of achieving the desired results as tattooists tend to place ink well into the dermis (the second layer of skin). Along with salabrasion this is one of the oldest methods of DIY tattoo removal. This involves sanding away or scraping the skin layers until the tattoo pigment is reached. Whilst the procedure requires an anaesthetic due to the intense pain it causes, many people do try this at home as a method of home tattoo removal. I’ve seen many devices advertised as dermabrasion tools, anything from wire brushes, sandpaper and even your average cheese grater! Similar to salabrasion. 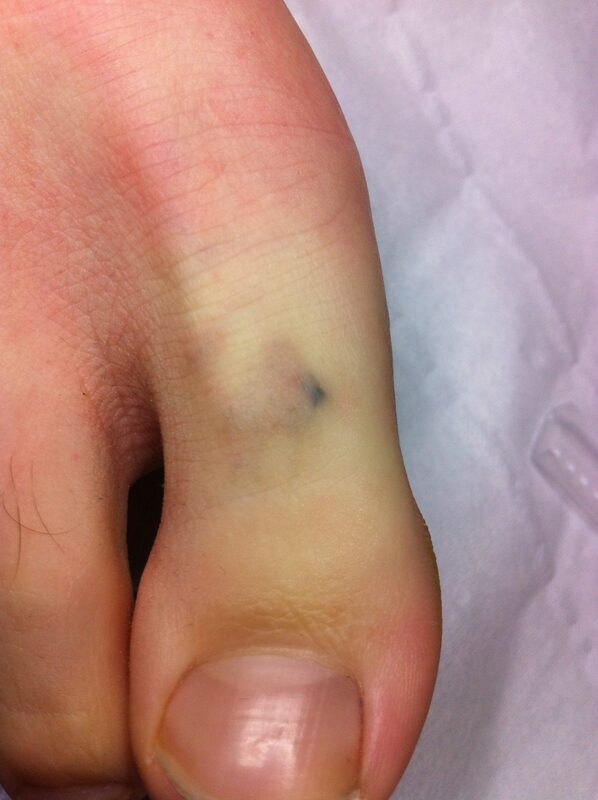 In addition to pain, infection, discolouration and permanent scarring, you can also expect bruising and bleeding. Do not attempt this. It is a very ineffective and risky way of removing an unwanted tattoo. This method of removing tattoos at home usually involves (but is not limited) to using TCA peel solutions. TCA stands for Trichloroacetic acid, which when applied to the tattoo, burns the upper layers of the skin. The stronger the acid percentage and the longer the acid is left on, the deeper it goes. Technically it doesn’t actually remove the tattoo, it simply bleaches the skin. TCA causes severe chemical burns to the skin. You can expect bleeding, weeping, burns, pain and scarring. Risk of infection is high. As with the above, do not be tempted to try this at home. This really does seem fantastic at first sight. A cream which when applied will simply dissolve your tattoo?! What’s not to like? Well for a start it won’t actually remove your tattoo or even come close to fading it, and this is why. How do tattoo removal creams work? Creams that you can buy online tend to contain ingredients like TCA (covered above) as well as other bleaching agents like hydroquinone, (often used for fading hormonal pigmentation like melasma), and kojic acid. Whilst this cocktail of bleaching ingredients will no doubt have some bleaching effect on the skin, they are not able to penetrate down to the dermis (the second layer of skin) which is where most of the tattoo pigment lies. This is also why hydroquinone is also pretty ineffective on dermal melasma as it is most effective in the upper most layers of the skin, called the epidermis. Whilst these are certainly less risky than the home tattoo removal methods already discussed above, tattoo removal creams are completely ineffective. Our advice is to save you money and your skin. This involves injecting acid into the tattooed area. How do acid injections work? Acid, often glycolic acid, is injected into the artwork. In theory the tattoo then forms scabs containing the tattoo ink, which then fall off. However, due to the fact the acid forces the ink up through the layers of the dermis and the epidermis, textural scarring can be significant. Problems with infection are also common. 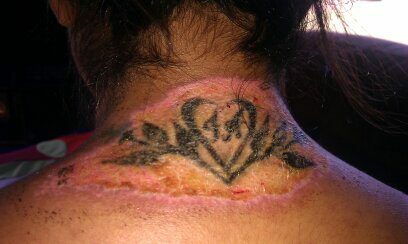 Pain, burning, infection, scarring and textural scarring. Acid injections for tattoo removal are highly ineffective and risky. Rejuvi uses an inorganic chemical remover designed to draw the pigment out of the skin. Rejuvi is injected into the skin by a tattoo or micropigmentation artist. The chemical compound then forces the pigment up and out through the various layers of the skin. 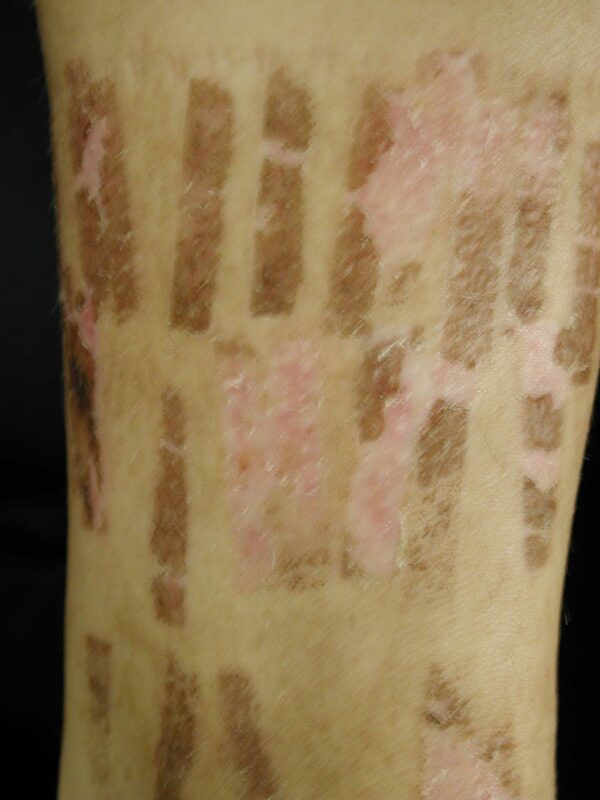 The transdermal forcing of the ink causes significant scarring and textural changes. One only has to Google, ‘rejuvi scarring’ to see the kind of damage this chemical does to people’s skin. Pain, burning, infection, extensive textural scarring. You’re better off keeping your tattoo. This treatment will give you extensive textural scarring. Another drastic measure taken by some to remove tattoos is surgical excision of tattoos. For small tattoos, it is possible to surgically remove tattoos by cutting them out of the skin under local anaesthetic. This should only be done by a surgeon or dermatologist. It is a drastic method for tattoo removal and can leave scarring. It is not always effective at removing all of the pigment due to the depth at which tattoo ink is normally placed. Pain, bruising, textural scarring and discolouration. ‘Cryo’ from the Greek, meaning ‘cold’ is the process removing unwanted lesions (like warts) by freezing them off. How does cryosurgery tattoo removal work? A freezing agent is sprayed onto the tattoo (usually under local anaesthetic), the layers of skin are then sanded off using some form of abrasive material. This method of tattoo removal is not commonly used in the UK due to the fact it is not very effective nor suitable for large areas. Scarring, unpredictable results, very harsh on the skin. Despite the fact that cryosurgery is performed by a skin specialist within a clinic environment, due to its inconsistent results and its unsuitability for large areas of skin, this is not something we would recommend. 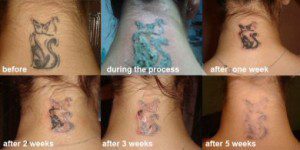 Laser tattoo removal is the only safe form of tattoo removal with minimal side effects. Unlike laser hair removal (where light is delivered in milliseconds) with laser tattoo removal, light, delivered in nanoseconds, thus creating a photo-mechanical effect on the skin, shattering the target (ink) whilst keeping the skin intact. Like with any laser treatments there are certain possible side effects, but unlike the methods above, these do not cause horrendous side effects like chemical burns and keloid scarring. Black tattoos are the easiest to remove and have the least side effects. Generally you can expect a fair bit of swelling with laser tattoo removal (the larger the tattoo the more swelling), but this generally goes down fairly quickly. Coloured tattoos, especially reds can blister, but as long as the blisters remain intact and do not get infected, they do not leave any scarring. Blisters are nature’s elastoplast whilst new skin is regenerated underneath. Pigment changes in the skin can occur with laser tattoo removal, some people are more prone to these than others. Hypo-pigmentation (lightening of the skin) or hyper—pigmentation (darkening of the skin) can occur, but these are nothing in comparison to the type of skin pigment changes which take place when using salabrasion for instance as a method for tattoo removal. When it comes to side effects, laser tattoo removal tends to come with ‘possible’ unwanted side effects like a slight lightening of the skin, whereas with most of the home tattoo removal methods above, they are ‘guaranteed’ side effects. In other words, you can fully expect to get chemical burns and irreversible skin changes if you try to remove your tattoos at home. You can also expect to get less than satisfactory results with these home tattoo removal methods, whereas laser tattoo removal can achieve fantastic results with minimal side effects. Is the Diode laser best for laser hair removal? As both a laser trainer and laser practitioner, I often get asked, ‘which is the best laser for laser hair removal?’ I also get asked whether a Diode laser which works at 810 nanometres (nm) is the most effect for laser hair removal. Whilst the Diode laser is certainly very effective for laser hair removal, it is by no means the best and most effective for permanent hair reduction. Lasers and Intense Pulsed Light (IPL) systems used for laser hair removal operate at wavelengths of between 650nm and 1064nm. Lasers use one single wavelength, so one single colour of coherent, non-divergent light. Think of the Star Wars light sabre, or single beam red laser pens often used at corporate presentations. Intense Pulsed Light (IPL), on the other hand, which is made up of white light (like a light bulb, non-coherent and divergent), is made up of several different wavelengths generally spanning from 650nm, to 1064nm. The advantages of IPL therefore, mean you get a variety of different wavelengths all targeting the same hair follicle. It also allows more flexibility in terms of being able to treat different skin types. Lasers like the Alexandrite (755nm) and the Diode (810nm) mean you can’t treat darker skin types. Laser hair removal is a constant balancing act between targeting the melanin in the hair shaft (and heating it to 60 degrees) and protecting the skin, which also contains pigment. The technical term for what we do when lasering your bikini line for instance, is called ‘selective photothermolysis’, directly translated meaning ‘selectively heating a target using light’. If the laser or IPL does not selectively heat the target (the hair) then it will also heat the skin and could cause burning and blistering. That’s why there is no such thing as ‘the best laser for laser hair removal’. In the end it doesn’t come down to which is the best laser, but rather which is the best laser for your skin and hair type. If you are fair skinned with dark hair, you can pretty much be treated with any laser (wavelength). That’s not to say there aren’t better lasers than others for this skin/hair combination. But if you are a skin type VI (black skin) you should only ever be treated with an Nd:YAG laser. Certain mixed race skin types can still use an IPL providing the machine has the scope for working at pulses of 5 with a 50ms delay. Alexandrite lasers should only be used on fair to Mediterranean skin types. IPLs are without a doubt more versatile and can be used to treat the widest variety of skin types. The key thing to consider when choosing a laser clinic is whether your chosen clinic has a choice of both laser and IPL. At Laser Skin Solutions we only operate medical grade lasers and IPLs, meaning you get treated with whichever system is most appropriate for your hair and skin type, and not because it is the only system we happen to have. Tattoos – do employers really care? Tattoos are more popular than ever and with tattoo parlours in Bournemouth and the rest of the country springing up on ever corner, body art is no longer relegated to the perceived ‘fringes’ of society. Indeed at our Bournemouth laser clinic, we see everyone and anyone from mums at home, to bankers and RAF pilots seeking laser tattoo removal. The increase of tattoo parlours and tattoo studios in Bournemouth has also inevitably seen a rise in laser tattoo removal enquiries. The reasons for wanting to remove a tattoo vary enormously, but at Laser Skin Solutions we see a large percentage of clients who need to remove their tattoos in order to secure their dream job. Some of our clients have been turned down at both the application and interview stage and told to return once their tattoo has been removed. So does having a tattoo really hinder your chances at securing employment? Despite the increase (and apparent increasing acceptance) of tattoos and body art, a survey by Vault.com found that 85% of employers said that having a tattoo would affect a candidate’s chances of securing employment. Tattoos are a strong form of self-expression and for many people, their tattoos carry a lot of meaning. The problem is, your future employer may not consider your choice of self-expression to be in line with their corporate image and the ‘meaning’ behind your art may be completely lost on them. It may surprise you to know that being turned down for a position due to having a tattoo is not considered discrimination in the eyes of the law. Under the Disability Discrimination Act (DDA) 2000, workers have no protection under discrimination legislation for having a tattoo. Body art does not qualify as “severe disfigurements that are treated as having a substantial adverse effect on the ability of the person concerned to carry out normal day-to-day activities”. So with no protection from the DDA 2000, unless your tattoo carries some religious significance (and you could prove this) currently employers are within their lawful rights to deny you your dream job. So why ‘think before you ink’? Surely you can just remove tattoos with laser should you have a change of heart, right? Wrong! Yes you absolutely can have laser tattoo removal should you change your mind, but laser tattoo removal is a lengthy process and body art is not something that can be removed over night or even within weeks. It takes months, sometimes a couple of years to remove a tattoo properly. Some tattoo ink colours can’t be removed at all, like yellows, turquoises, purples and orange. The easiest tattoo colours to remove with laser tattoo removal are black and red, and sometimes greens if you are able to find a laser clinic with a Ruby laser. The Ruby laser was the first laser hair removal machine and is now considered to be very old technology for permanent hair removal due to the side effects it can cause. When Q-Switched, the Ruby can treat green tattoos, but as most clinics discover, it’s an extremely expensive piece of kit to buy (we’re talking tens of thousands) when it can only treat green tattoos. Our advice has always been ‘think before you ink’ but not in terms of whether you should ink at all. To keep your future career options open, you may decide to have your tattoo inked on an area of your body that can be easily covered up should you wish to do so. If you want to wear short sleeves in the summer for instance, a full sleeve tattoo may not be the best option. 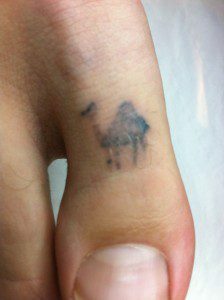 For many people feet and ankle tattoos are a good option, but even then it can occasionally cause problems. A laser tattoo removal client at our Bournemouth laser clinic discovered he couldn’t get his dream job on a super yacht because he would spend most of the day barefoot. Although clearly qualified, he was rejected due to the 4 tattoos on his feet. He is currently having these removed, but his career in the Bahamas has had to be put on hold. At the end of the day, it’s your body and your life and we live in a free country. Ironically however, we do see many cases at our Bournemouth laser clinic where such freedoms of expression end up hindering and limiting career choices for people. So do employers really care if you have a tattoo? From our experience, yes, they absolutely do. The holiday season is in full swing and radiant, glowing skin is the ultimate beauty accessory. At our Bournemouth Laser and Skincare Clinic we often get asked how to keep skin looking at its best this time of year. Harsh winter weather, late nights and alcohol can leave our skin looking tired, dull and life-less. Help is at hand however. Here are 6 ways to help ensure your skin is looking tip-top for the party season. We always advise our clients to drink 1.5 litres of water per day to help skin rejuvenation. This is even more important over a period where people generally consume more alcohol than usual. Alcohol dehydrates your skin making fine lines and wrinkles look worse than they actually are. It will also make you feel better and more energized as being permanently dehydrated is not only bad for your skin, but creates stress on the body. Dull and lifeless skin is often due to a damaged lipid barrier. The lipid barrier is the top layer of the stratum corneum and is held together by lipids, ceramids and fatty acids which help to protect our skin from allergens, bacteria and irritants. If your skin feels sensitive, dull or flakey, chances are your lipid barrier has been impaired. Using good serums and moisturisers will help repair the barrier and protect against further damage. At Laser Skin Solutions we use and recommend Jan Marini products. The quickest way to get rid of dry flakey skin is to exfoliate. At Laser Skin Solutions we do not recommend using scrubs on the face as these are too harsh. Instead we recommend using glycolic acid and having glycolic peels. Dead skin cells on our faces are held by a glue-like bond making our skin look dull and lifeless. Glycolic acid which comes from sugar cane, dissolves this glue-like cement, allowing dead skin cells to gently come away, leaving the skin looking smooth and radiant. Sleep is undoubtedly one of the single most important things you can do to improve your skin and overall health and immune system. Regular sleep of 7-8 hours each night, along with the other 5 tips in this blog article will keep your skin looking and feeling at its best. Did you know that 90% of all the damage on our face (wrinkles, thread veins, pigmentation etc) occurs between September and May, and not during the summer months as most people think. Winter rays are extremely damaging as UVA (which is the same strength all year round) penetrates deep into the dermis causing skin ageing. We recommend you wear a zinc oxide SPF30 all year round. 6. Hang your head upside down. Sounds bonkers, but doing a yogic headstand (or simply hanging your head over the side of the bath or your bed if you prefer) sends blood rushing to our heads. Our hearts constantly pump blood against gravity around our bodies. Spending 3 minutes per day with your head upside down is believed to help improve skin complexion. I have to admit it doesn’t appeal, nor do I have the time to do this. Water, glycolic peels and good skincare products are my preferred choice. Which is best? Laser hair removal or IPL hair removal? At Laser Skin Solutions, Bournemouth we often get asked whether we have a laser, for laser hair removal, or an IPL (Intense Pulsed Light). Fortunately, we have both, meaning if you are looking for laser hair removal in Bournemouth, once we have assessed your skin type and hair, we will choose whichever system is going to get you the best (and quickest) results. But what is laser? And is it different to IPL? The answer is both ‘yes’ and ‘no’. It really comes down to physics. Both laser and IPL are light sources. Both are used to heat or shatter targets, whether it’s to heat and destroy hair follicles for laser hair removal, or to shatter ink under the skin for laser tattoo removal. Laser is an acronym, which is why it makes no sense that the Americans spell it with a ‘z’ – ‘lazer’. It stands for Light Amplification by the Stimulated Emission of Radiation. Laser light is characterised by a single, coherent, non-divergent beam of light and is made up of a single wavelength (i.e. colour). Intense Pulsed Light (IPL) on the other hand is made up of white light – which as many of us will remember from our school days – white light when split by a glass prism shows up all the colours of the rainbow. White light is made up off several different wavelengths (colours) and is non-coherent, and divergent. So what does this have to do with laser hair removal and which is better? Is Laser or IPL better for laser hair removal? There is no definitive answer because much of the answer lies in the skin type of the person you are treating. There are several lasers used for hair removal. Each has their advantages and disadvantages. IPL on the other hand can treat nearly all skin types (1-5 on the Fitzpatrick skin-type scale) except black skin. However not all IPLs are the same. There are many nasty, cheap IPL machines out there and navigating your way through them can be a bit of an IPL minefield. As a rule of thumb the best advice is to stay clear of beauty salons which tend to buy cheap IPLs from China or worse still, hairdressers with cheap equipment offering groupon laser hair removal deals. Beauty clinics and hairdressers are not laser clinics and therefore don’t tend to invest in the £60K plus required to purchase medical grade equipment like the ones found at dedicated laser clinics. Whether you are being treated with a laser or IPL, the aim in any laser hair removal treatment is to heat the hair follicle to around 70 degrees for a split second. Medical grade lasers and IPLs will do this, meaning the stem cells at the base of the follicle are heated and permanently destroyed. Cheap lasers and IPLs however do not emit peak powers to heat the follicle sufficiently for permanent destruction. If you are trying to decide where to have your laser hair removal in Bournemouth, always ensure your chosen clinic is using medical grade lasers and that they can offer you a choice of both laser hair removal and IPL hair removal. At our Bournemouth based laser clinic we have 3 different laser and IPL handpieces for hair removal alone. Clinics may well have different lasers or IPLs for other treatments like laser acne treatment, or laser thread vein removal, but this does not mean they can offer a choice of equipment for one single application like laser hair removal.